My Creative View: Snuck one in! I am supposed to be cleaning and organizing my scrap room among other things. But when I saw the Club CK One Hour Challenge-use circles, was at a time when I could participate, I had to do it! So I did! Not only did I write my journaling before I had a title, I realized they Frosted Designs 3/2 Friday Challenge is Numbers! So for the first time ever, I took my title from my journaling. I never do that! Voila! Double Whammy! 2 really fun creative challenges. I used a sketch that I found on Pinterest by Jana Eubank. I'm always looking for ideas on how to use one vertical and one horizontal photo. My PP are Echo Park and MME. The big circle chipboard is MAMBI that I painted with Making Memories paint. I painted the banner cycles with Glimmer Mist, but they came out really flat so I added Stickles around the edge to jazz them up a bit. The number are Thickers, the letters and word circles are MAMBI. The small chipboard dots are Fancy Pants. Ribbon is unknown. Twine is MME and the journal tag is also EP. Ok, back to work now. Playtime is over. This is beautiful!!! I love all the circles, the placement of the numbers look great. thanks for playing with us at Frosted Designs. Bravo, Devra! You did an awesome job with the 1hr challenge! Very cute! What a cute little boy! 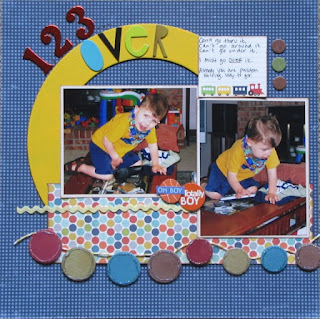 Adorable layout - love all the circles! Thanks for sharing with us at Frosted Designs! What a cute boy!! Love how you use the numbers for the title. Thank you for playing along with us at Frosted Designs.